"You must understand that I did not become a resistance fighter, a smuggler of Jews, a defier of the SS and the Nazis all at once. One's first steps are always small: I had begun by hiding food under a fence." Through this intimate and compelling memoir, we are witness to the growth of a hero. 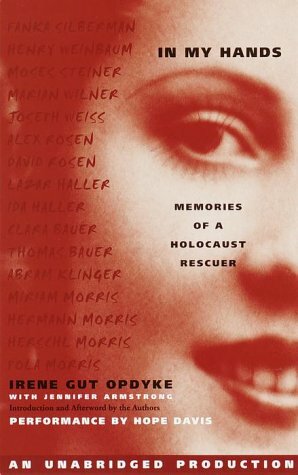 Irene Gut was just a girl when the war began: seventeen, a Polish patriot, a student nurse, a good Catholic girl. As the war progressed, the soldiers of two countries stripped her of all she loved—her family, her home, her innocence—but the degradations only strengthened her will. She began to fight back. Irene was forced to work for the German army, but her blond hair, her blue eyes, and her youth bought her the relatively safe job of waitress in an officer's dining room. She would use this Aryan mask as both a shield and a sword: She picked up snatches of conversation along with the Nazis' dirty dishes and passed the information to Jews in the ghetto. She raided the German Warenhaus for food and blankets. She smuggled people fron the work camp into the forest. And, when she was made the housekeeper of a Nazi major, she successfully hid twelve Jews in the basement of his home until the Germans' defeat. This young woman was determined to deliver her friends from evil. It was as simple and as impossible as that. If you have any questions about this product by Brand: Listening Library, contact us by completing and submitting the form below. If you are looking for a specif part number, please include it with your message.